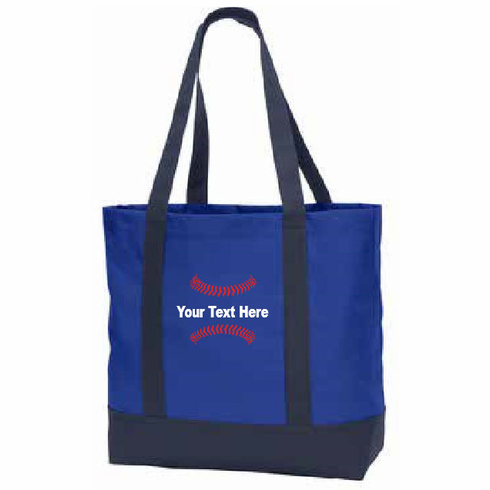 Personalized Embroidered Baseball Day Tote - BG406. This classic, go-anywhere day tote is perfect for the ballpark, beach, market, and beyond. 600 denier polyester, self-fabric handles, measures appx. 14"h x 14"w x 5.5"d...appx. 1,078 cubic inches. Up to 15 block characters and/or spaces can be personalized inside the baseball stitches on the front. All stitches and text are embroidered! *** DOUBLE CHECK ALL TEXT...SELECT THE CORRECT COLOR...ALL SALES ARE FINAL ON THESE CUSTOM TOTES!! !